12-inch single driver, bass-reflex, dual high-velocity low-turbulence resistive ports, built-in amplifier, USB Port / PBK Interface. 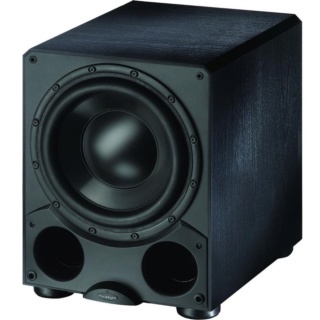 900 watts Dynamic Peak / 300 watts RMS. 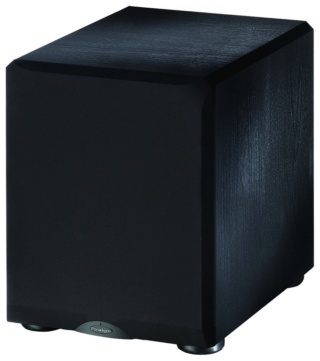 Advanced High-Power Class-D™ Amplifiers deliver massive amounts of high-current power with minimal distortion. 900 watts Dynamic Peak / 300 watts RMS. Forward-Firing Drivers with Advanced CAP™ Carbon / Aramid-Fiber Polypropylene Cones. Advanced cone material combines exceptional stiffness/low mass with excellent internal damping for tremendous freedom from unwanted resonances. Advanced Suspension Design and Large Magnet Structures encourage extended cone excursion while maintaining superb control over cone movement. High-Efficiency Dual-Ported Design. High-velocity low-noise ports with critically flared openings serve to reduce turbulence distortion. Front-ported design accommodates installation flexibility. Removable Grilles with AVS™ Airflow Ventilation System allow release of the enormous air pressure generated by these high-output designs. Acoustically Inert MDF Enclosures serve to limit unwanted panel resonances and vibrations, ensuring clean, clear and very articulate bass performance. Dimensions HxWxD 18.25" × 14" × 19.5"
» anyone else get a defective paradigm dalek?